Santorini is highly popular due to it’s dramatic views, and stunning sunsets. It has been known to be one of the most romantic travel destinations in the world. There is only about 15,000 people living on the island, however Santorini gets about 1.5 MILLION visitors a year! 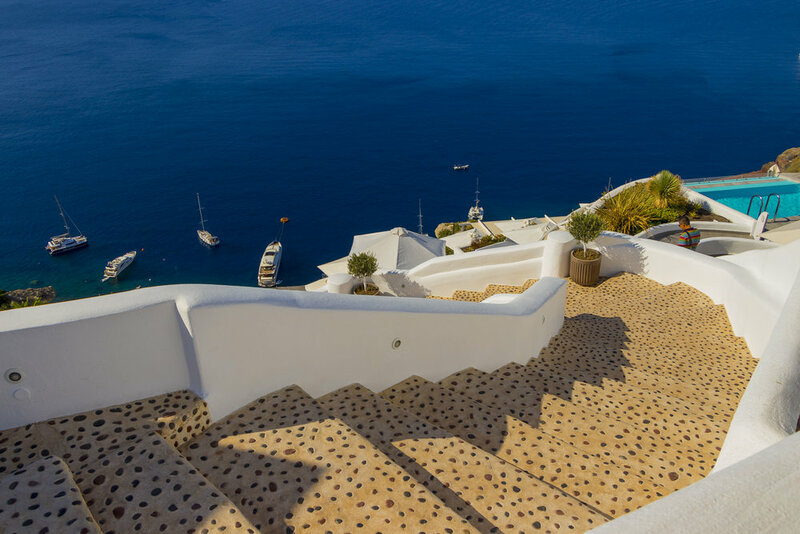 Santorini is filled with blue and white buildings because Blue & White represents the colors of the Greek flag. White represents the purity and blue symbolizes the sky and the sea. A massive volcanic eruption around 1650 B.C. forced the center of what was then a single island to implode and succumb to the sea. So now the island itself sits in the water filled caldera of this massive volcano. Santorini’s streets are very narrow, and most are too narrow to even fit two vehicles. Therefore, it is best to get thru the city by mopeds, scooters, and bicycles. Of course there is always walking which I always recommend, to best see and experience the city! If this isn’t your style there are also cabs that you can hail rather than fighting with traffic and the chaos of renting a car. Should you decide to rent a car, be aware that an international driver license is required. Santorini's rich volcanic soil is ideal for growing grapes, making the wine the best choice to try! Head to a local tavern to try some of Greece’s Best wine!